Situated in South Mission Beach, one block from the ocean and overlooking the bay! This two bedroom condo is beautifully furnished with just steps to the Beach, Bay and Entertainment. AC has become more of a must have feature on San Diego beaches during the warm months. We have added a portable AC to each of our bedrooms to keep up with our past guests' suggestions. Not having AC means that you have to sleep with your window open and this makes you more susceptible to noise (every place in Mission Beach is susceptible to noise problems regardless of what other owners tell you). Now our guests have the option of sleeping with the windows closed! Upgraded bathrooms and open kitchen with top of the line designer stainless steel appliances. All dishes, utensils, pots, and pans are provided for you. Family entertainment is within walking distance. Park your car in your reserved dedicated spot and leave it! You can stroll (5 min walk) to Belmont Park, ride the Roller Coaster, buy some cotton candy and play carnival/arcade games. Bring your kids with their friends because this condo sleeps six. The living room is equipped with a 50' Sony flat screen, cable (DVR/HD), sofa and a large chaise, in which both convert to beds (queen and twin). In each bedroom, there is a queen bed, and 40' Sony flat screen. The Master Bedroom has a unique designer Star Gazer ceiling complete with ceiling fan. The Master Bath is equipped with a Jacuzzi bathtub with his and her shower heads. Sit & relax at the cocktail table on the nice quiet balcony! The Balcony has a view of the Bay and features a Cocktail Table that is perfect for your morning coffee or those relaxing evening drinks. I retired in 2016 with 24 years of active duty service in the SEAL teams. I moved to Mission Beach in 1994 and fell in love with it. This property is 200 meter from the Ocean and 100 meters from Mission Bay! 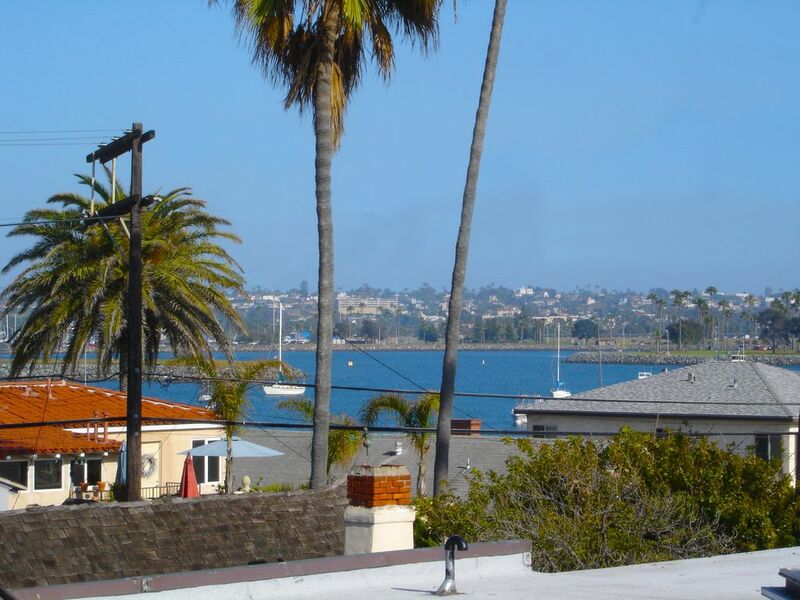 Relax on the Balcony with a South facing view of gorgeous Mission Bay!! There are AC units in each bedroom. Fresh linens provided. In addition to washing all of the towels and sheets we also wash all of the rugs and bed coverings between each guest. Full access to complete washer and dryer facilities with sink and folding table. Bath towels are available. beach towels are also available upon request. Brand New! Top of the Line Whirlpool. Whirlpool Stainless Steele Designer Dishwasher! Brand New! Top of the Line! Stainless Steel GE. GE Designer Series Stainless Steele! Brand new Microwave---ready to go. Brand New Custom Euro-Pacific Styled Kitchen! Brand New---just Done! Completely remolded with top of the line designer appliances, bar seating AND booth seating. Gorgeous Granite Counter tops with cool breeze ceiling fan are ready for even the most experienced home chef. Plenty of room to operate in this professional kitchen! Giant 50 Inch Sony LCD Flat Screen in the Living Room and 40 Inch Sony Flat Screens in each bedroom!---with 900 channels and DVR!! Quiet Balcony with seating for those evening coctails or a nice morning coffee with a Bay View! Hard to find at first but Google Maps is actually pretty accurate, including the picture of the property....finding where to turn to park was initially confusing, but it was actually nice to have a dedicated parking slot near the door. Property is secure (key required to get into building). Washer-dryer facilities are not en suite...just be aware of that..it's on the 1st floor (we never used it so cannot offer an opinion). Also, the unit is on the 3rd floor so you will need to use either the small elevator or the stairs. Location-wise, it's great. Not beachfront, but convenient to Belmont Park, restaurants and the Mission Beach boardwalk! The unit itself is clean and had everything we need including start-up kitchen supplies. The bedroom AC's are a must-have! We had an issue with the bathroom sinks upon arrival but Lorne fixed them within 24 hours while we were out and about. Lorne also had 2 beach chairs, beach towels and beach toys our 4-year old happily took advantage of. He had other beach toys too that we did not use. Make sure you bring multi-plugs for your tech gadgets! Loved the area and Mission Beach boardwalk area, in particular, and will definitely consider staying here again if we are ever in San Diego again. Proximity to Seaworld, Zoo, La Jolla etc. are unbeatable as well. Thanks for the good review! I am glad you enjoyed your trip. I want to let any readers know that most of the elevators in Mission have been removed because of the maintenance cost. Our Elevator is rarely down and it can take a family of 4 up to the unit with all of their luggage. I would not call it small. The size is sufficient for the size of the building. Lorne was great to work with. Helped get us in earlier than planned on arrival date and made sure we had what we needed. The AC was a must for sleeping I would not stay somewhere without it. Beach was a five minute walk that does require crossing a busy street. Condo was clean and had all necessary supplies and lots of extras. We had easy access to SeaWorld and the other activities we did. Highly recommend this condo if you want to stay in Mission Beach. This condo was located a block from Mission, a short walk to the waves. Everything was as advertised, fully outfitted kitchen and grill was appreciated as well as basic condiments in the cupboards. Loren was a responsive host. It was helpful being met by Loren and Annette as we checked in. I would stay there again! This was a great place to stay! Really close to the Bay and not to far at all from the beach! Had everything you would need and Lorne was really great to communicate! We would definitely stay again! I was very happy with the condo. The location is great and the condo was very comfortable and clean. Lorne the owner was very nice and accommodating. We stayed from 6/9 thru 6/16/18. Loved the loacation ! Minutes to everything! Steps to the beach! Quiet neighborhood! Access the Beach & Bay---steps to the sand. Walk to Belmont Park Amusement Park with Roller Coaster right on the beach, Surfing, Kayaking and see the seals, or go Jet-skiing all within walking distance! Plenty of shops to eat, get ice cream, grab a beer, see the sunsets.